We provide high-quality, new kitchens and tailor-made detailed joinery to meet our customers’ exact requirements and can work with a range of differently sized spaces for your convenience. Our flawless attention to detail starts with providing our clients with detailed product knowledge and most importantly listening to what they want and offering design ideas if they aren’t quite sure how to maximise the use of their space. Our clients are confident in our whole-hearted commitment and our ability to deliver their joinery as promised, on time and budget, to the highest quality. Communication and impeccable customer service is what makes Trim Joinery stand out from its competitors. Our team will keep you informed throughout the entire process and always be there to answer any questions you may have. 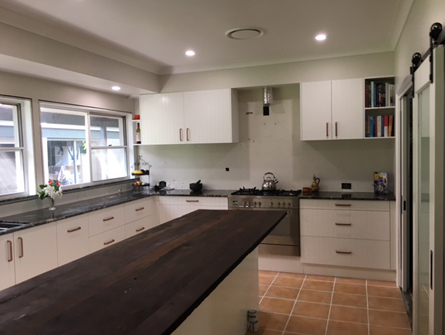 We want our clients to enjoy the experience and be excited to receive their new joinery. This should never be a stressful or anxious time and our total commitment to providing a high level of customer service will ensure the job flows flawlessly and our clients always at ease.